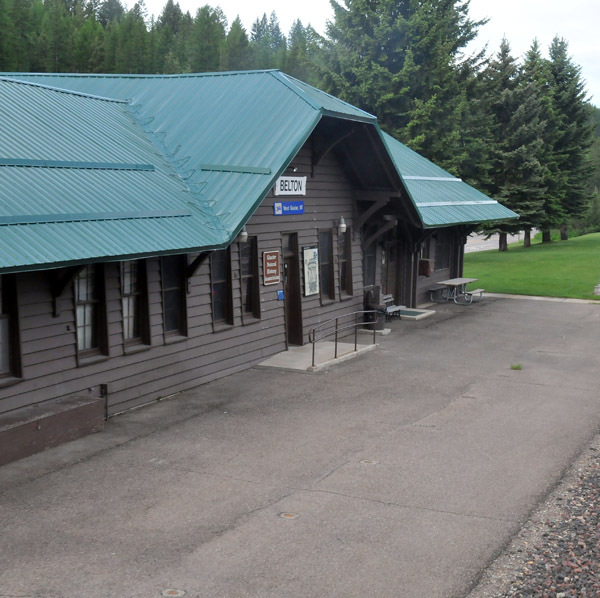 Constructed sometime between 1906 and 1910, the depot features rough-hewn siding that gives it a rustic appearance in keeping with other early buildings in Glacier National Park. Amtrak passengers at West Glacier use the platform adjacent to the historic Belton depot, which now houses a retail shop run by the Glacier National Park Conservancy. The non-profit group assures the Glacier National Park experience by providing support for preservation, education and research through philanthropy and outreach. Rough-hewn siding extends over the entire structure and gives it a rustic appearance that blends well with the surrounding park. The center of the building includes a prominent cross-gable with a clipped gable roof. One of the conservancy’s predecessor organizations received the depot in 1991 as a donation from the Burlington Northern Railroad (now part of BNSF). It was renovated with attention to the cultural history and significance of its original use, and its overall appearance has changed little through the years. Great Northern Railway (GN) moved through this part of Montana in 1891 as it worked to complete its transcontinental line between St. Paul, Minn. and Seattle. The new community, known as “Belton” after an early settler named Bell, had a depot (two box cars, one of which was the station agent’s residence), hotel, saloon, store and post office. As word spread of the region’s beauty and abundant wildlife, tourism began in and around what is today Glacier National Park. To serve these new passengers, the railroad constructed the current wood frame depot sometime between 1906 and 1910–accounts vary on the exact year. It was later enlarged in 1935, with the older section becoming the baggage and express area. In an effort to further foster tourism to the Rocky Mountains, which early boosters romantically termed the “American Alps,” the GN built a series of nine Swiss chalet-type hotels in the region beginning in 1909. One of the first of these resort hotels was the Belton Chalet, erected south of the depot and connected to it by a trellised pathway. It opened in June, 1910, a month after President William Howard Taft designated the area a national park.